Last week I made my first garment of the new year. I'm calling it my Ladder Tunic. The design and drafting of the pattern went well. The fabric was entirely appropriate. My sewing machine and serger behaved impeccably. I only had to rip out one short bit of sewing. I discovered a wonderful new sewing tool. And I think the final product has worked out very well. So what was so scary? Well, the design in my head required me to mostly finish this top and then cut it up! WTF? After doing some texture samples on jersey last month, I knew I wanted to try out some of those techniques on wearables. 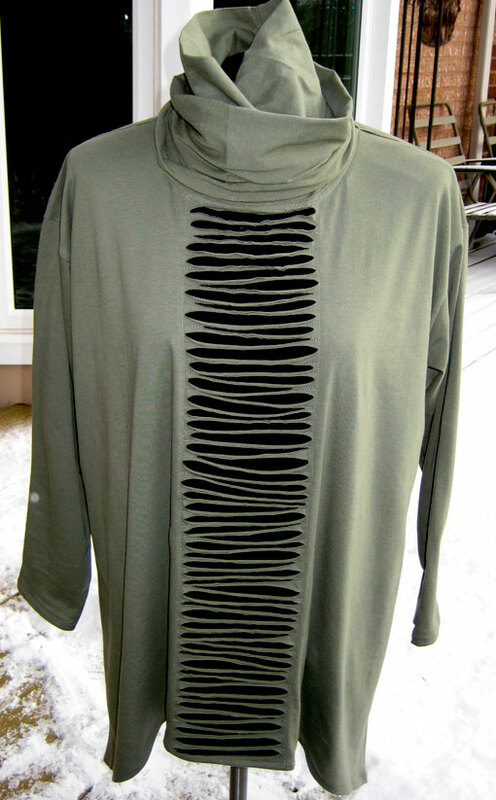 And the one I wanted to use first was slashing to create a distressed fabric. I used a self drafted pattern. 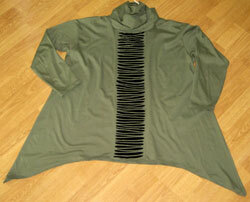 This is a long, loose tunic with dropped shoulders, an asymmetrical hem and a double neck treatment. This has a classic "lagenlook" unstructured shape that works with leggings, narrow pants or a long skirt. In case anyone is interested in sewing something like this, Butterick 5203 is quite similar in silhouette. When I sew this pattern again, I think I will narrow the shoulders a smidge to further emphasize the trapeze shape. But otherwise it fits very well, including the bicep diameter and the sleeve length. It could also be lengthened for a dress/longer tunic. 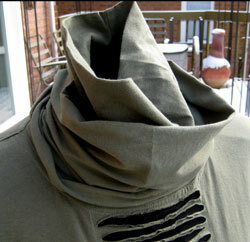 The neck is a high turtleneck plus a tight cowl. To avoid bulk, I didn't sew the cowl into the neck seam. Instead it is a separate piece and simply attaches at center back with a small snap. This allows some wearing options and is removable for easier ironing. And yes, that is snow in the background of this next picture. It's winter. It's Canada. I wanted to sew this in cotton jersey, but of course that fabric is completely absent from my local sewing stores this time of year (hopefully the spring fabrics will be in soon). 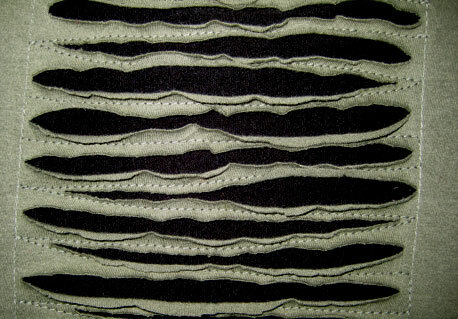 However I was able to find this 95% bamboo, 5% spandex fabric in a soft army green colour which behaved pretty well. 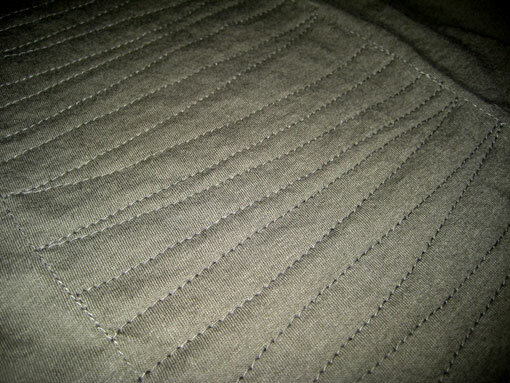 The fabric was a bit tricky to sew in that the cut edges rolled like crazy - much more than regular cotton jersey. I guess that is the spandex at work. The underlay of the front panel was a scrap of soft 100% bamboo tissue jersey that I had from a previous project. I wondered it the lighter weight of it would be problematic, but in fact I think it was an advantage in that it stops the front panel from being stiff. This sewed together very well for the most part. As I said, the cut edges of fabric rolled a lot. It wasn't too bad when I was serging the seams , but it gave me some grief when it came to the long, curved hem. It was rolling like crazy even after pressing and pinning wasn't helping to keep this flat in any way. And then I remembered a set of Clover Wonder Clips that I had picked up at Michaels over the holidays but never used. These are small plastic clamps that have a good strong spring and are flat on one side so that they lay flat on the sewing machine bed. 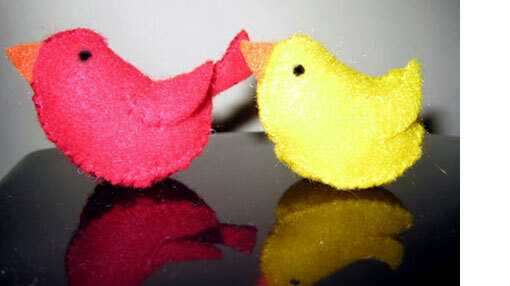 I have to say that these little babies are amazing. I may never pin again! They can grip right at the edge of the fabric - so in this case they tamed the rolling fabric - and they really grip. Easy to remove as you sew too. And there's no chance you'll sew over one of these by mistake and break your needle. 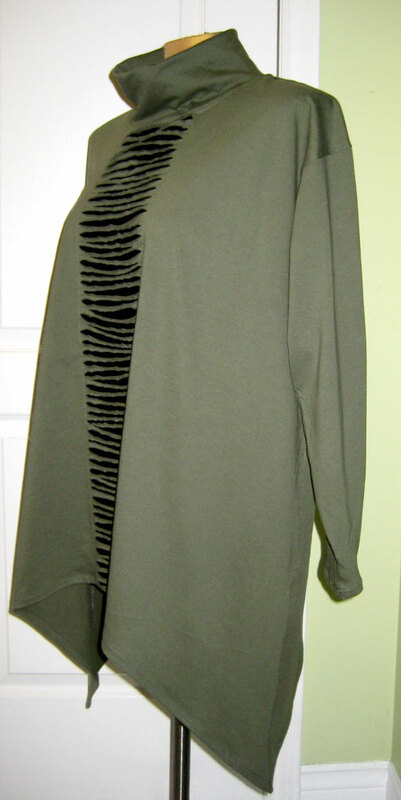 They also add a little weight to the edge of the fabric - which was a definite advantage with this garment. I have the 10 clip set, but there is also a bag of 50 available. I know what I'll be using my next Michael's coupon for! The front panel was obviously the scary part. To make it, I sewed a long strip of black jersey behind the front of the finished top (prior to hemming) and sewed irregular horizontal lines all down this panel. The lines are no more than about 1.5cm apart and some are more diagonal than others. Once this pattern had been sewn, I then took very sharp fine point scissors and cut between the lines. The natural tendency of the fabric to roll took care of the rest. A little steaming sorted out any lines that weren't rolling as much as the others. I am very pleased with this technique. 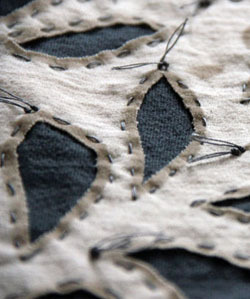 It allowed me to add some considerable texture to what was otherwise a very simple fabric. But did not add any appreciable volume to the garment. I don't need more volume. I have plenty of my own. I'd like to use this again, perhaps in a single colour or tone on tone effect.